What is happening? Ligon Duncan sat on stage at the ShepCon Q&A and tried to assure us (quite unsuccessfully) how totally non-liberal and uncompromising he is. Then, he went to the Ligonier Q&A and endorsed the work of a gay priest who he said was the best one to teach us the Biblical sexual ethic. Today, when pressed on Twitter, he (seemingly) called out for support from a pro-gay advocate. Then he deleted it. It’s bizarro world. 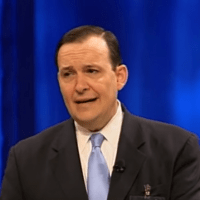 Frankly, Ligon Duncan has had no more negative things to say about Revoice than he did the Dallas Statement…it’s problematic, we don’t think it represents us…you know, stuff like that. It’s what Duncan did say about Revoice at the Ligonier Q&A that befuddled many, however. Duncan claimed that Revoice had no ties to either the PCA or the SBC. That’s simply untrue, unless Duncan means that it didn’t have the official endorsement of either denomination, but no one was arguing that in the first place. The fact is, the conference was held in a PCA church, had the support of many in the PCA, and was endorsed by an ERLC research fellow who Russell Moore vehemently defended only weeks prior. Tom Buck was referring to Karen Swallow Prior, who we first warned you was gay affirming back in July of 2015. Buck, who was a contributor at P&P at the time, left our organization afterward. Eventually, however, Buck called for her resignation from the ERLC three years later, in July of 2018, after she doubled-down on her support for Revoice.